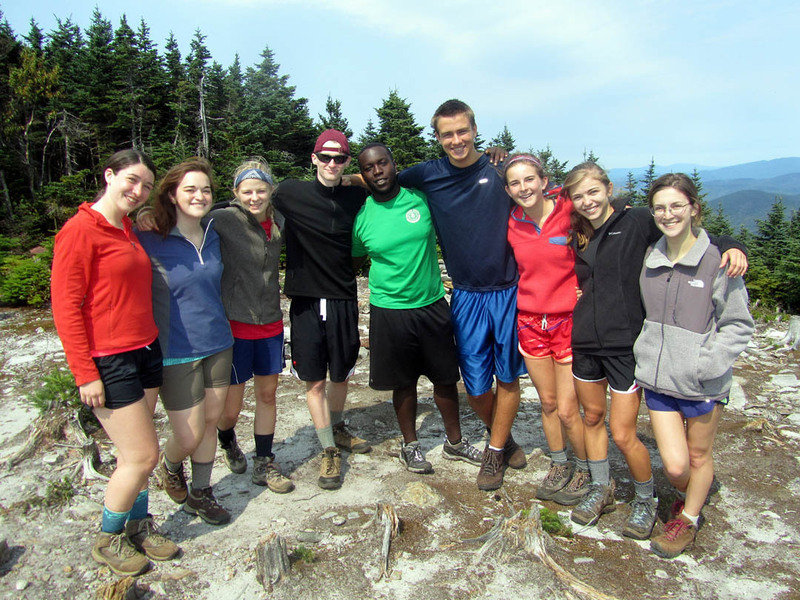 Co-leader Nate Davis ’14, wearing the green shirt, poses with the Grafton Notch I AESOP group. Photograph by Simone Schriger ’14/Bates College. When I found out about Bates’ Annual Entering Student Outdoor Program, I was stoked. Discovering that Bates had an outdoors program run entirely by students impressed and excited me and confirmed, once again, that Bates was the community I wanted to be a part of. My passion for the outdoors started in high school. The summer before 11th grade, I went on a two-week trip combining all sorts of activities in Northern California with a group called Adventure Treks. It was here that my love for the outdoors began to blossom. The following summer, I ventured on a month-long backpacking trip in Wyoming through the National Outdoor Leadership School. This challenging trip strengthened me in innumerable ways and reignited my passion for nature. Nate Davis ’14 keeps a protective eye on AESOP participants on the trail. Photograph by Simone Schriger ’14/Bates College. So when I arrived at Bates, I felt confident discovering that I’d been assigned to a Level 5 backpacking trip in the Presidential Range despite never having set foot on a New England mountain before, knowing nothing about Mount Washington and knowing no one at Bates. Sure, I was apprehensive, but there’s something about the back country that facilitates bonding and growth so it was an excited and eager apprehension. I remember the first afternoon, when everyone on our trip had finally arrived and we got to meet our trip leaders for the first time. We were told what to pack and where to meet the next morning, and then were freed to roam campus for the evening. I felt a strong sense of autonomy. Just setting my own alarm clock had its own unique thrill; throughout high school my dad had to use all sorts of crazy tactics to wake me up, and now I was on my own. It was my responsibility to meet up with the group on time, and I was really keen to be a part of that. I still remember the moment I felt the click of being a Batesie: It happened the morning we departed. Our newly formed group headed out, music blasting so loud the car’s walls were bending, making occasional pit stops at a drugstore to pick up packets of hot chocolate or to use the restroom. It was very clear, even this early in the trip, that our AESOP leaders were both peers and role models. I was consistently surprised that AESOP wasn’t like the camping experiences I’d had before in which you’re a camper and they’re a counselor and there’s a barrier between you. It was very much more informal than that, much more fluid. Our leaders were Megan Schleck ’11 and Cody Newman ’11. There weren’t any situations where I felt talked down to or even really instructed in a way that was anything other than just a friend speaking to me. Afterward, I felt comfortable waving to Megan and Cody when I saw them on campus and that meant a lot to me. Being an AESOP-er was a wonderful experience. I’m still friendly with all the other students on my trip, and it was wonderful having the opportunity to get to know a few students before orientation even began. Though the days of hiking were challenging, they were also incredibly rewarding. 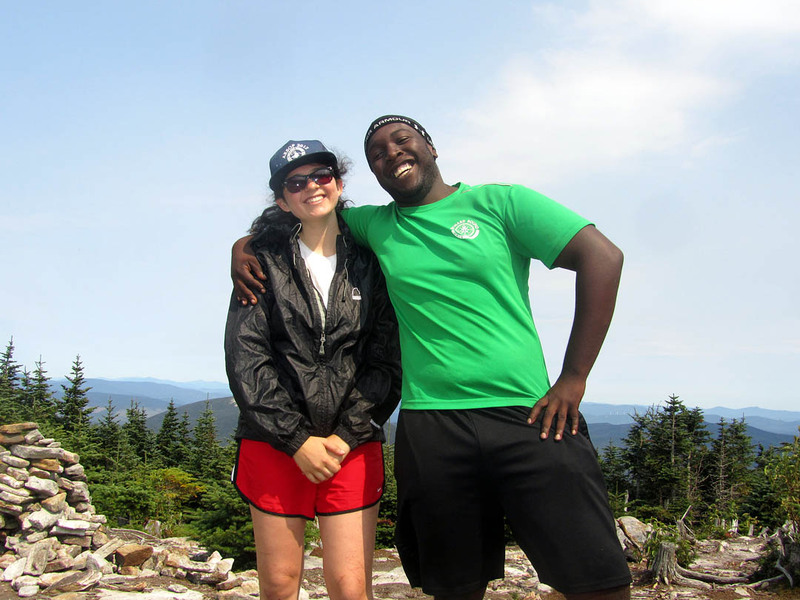 Simone Schriger ’14 and Nate Davis ’14 co-led the Grafton Notch 1 AESOP trip. Photograph courtesy of Simone Schriger. At the top of Mount Washington, I felt a great sense of accomplishment not only because I had summited, but because I had done so with friends. It was a moment of transition from high school to college, a moment where I felt confident in myself, my independence and my ability to succeed at Bates. After that experience, I wanted to stay involved in the program. So I became an AESOP leader. As a sophomore, I led a “chilling trip” in Acadia that consisted of day hikes and relaxing on the beach. 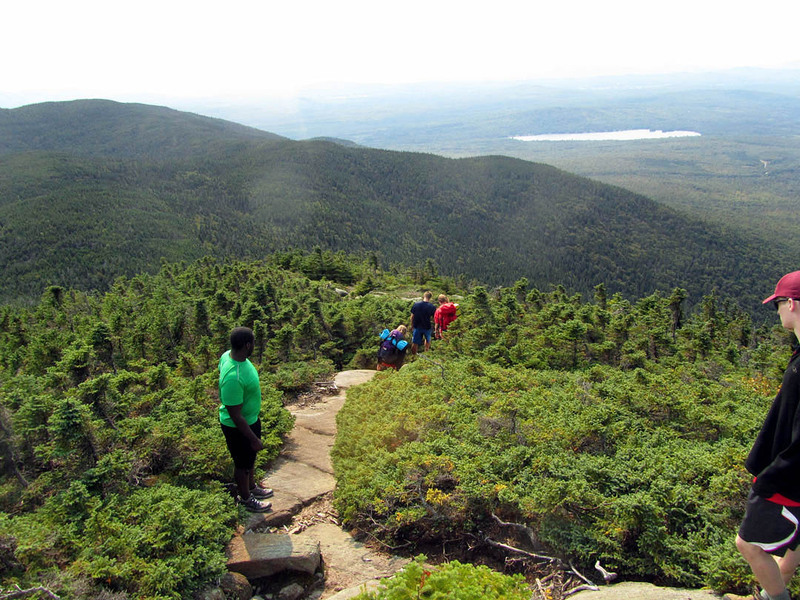 This year, with Nate Davis ’14, I led a backpacking trip at Grafton Notch, going back to the White Mountains. Despite their different itineraries, both trips were strong leadership experiences and were a good way to get to know first-year students. I tried to adapt Megan’s and Cody’s styles to my own behavior as a leader. My goal was to create an environment that was both safe and very open: not so unstructured and unauthoritative that people felt lost or insecure, but still full of jokes and silliness, and lots of freedom. I tried to maintain that balance each day. As a leader, I felt equipped with the skills to keep everyone on the trip safe and to provide support when necessary — but beyond that, I was there to get to know the students and try to provide them the type of experience I had as an incoming first-year.